1871 – Jefferson Franklin Long becomes first Black person to speak in the House of Representatives. A politician from Georgia, he was the second African American sworn into the US House of Representatives. He spoke in opposition to the Amnesty Bill which exempted former confederates who wanted to serve in the House from swearing allegiance to the U.S. Constitution. 1902 – Poet and author Langston Hughes born in Joplin, Missouri. Hughes was one of the leaders Harlem Renaissance in New York City. He pioneered jazz poetry, a new literary art form. He is considered one of the most important and influential writers of his time. 1960 – Greensboro sit-ins take place. 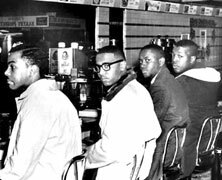 Wanting to change the segregational policies of five-and-dime store Woolworth’s in Greensboro, North Carolina the four students from North Carolina A&T University occupies seats at the store and asked to be served. When they were denied service at the “whites only” counter, and were asked to leave by store manager Clarence Harris. They refused to leave and stayed seated until closing. The next day more students came and on February 3rd, more than 60 Blacks joined the sit-in. The media did pick up on it and drew attention to segregation in the south, leading to the Civil Rights Act of 1964 being passed.The hope of the protesters was to draw media attention to the segregation practices of the store as well as implemented throughout the south.In 1993, the Smithsonian Institute acquired a four-seat portion of the lunch counter and tthe rest of the counter now belongs to the International Civil Rights Center & Museum in Greensboro, North Carolina. 1997 – First 24-Hour Black Movie Channel. BET Holdings and Encore Media Corp. launched BET Movie/Starz, the first 24 hour Black Movie channel. The channel focused on black cinema and urban entertainment, and ran under that name until 2001 when BET puled out of the venture. The channel continued on as Black Starz! until 2005. 1990 – Ida B Wells commemorated on a postage stamp. Wells was an investigative journalist, noted for first gathering statistical records on lynchings in the United States. An early leader in the Civil Rights movement, she was also one of the founders of the National Association for the Advancement of Colored People (NAACP).